Lay everything out on a clean, flat surface. Plug in your glue gun, while it warms up lay the candy out to see how best they fit. Use a small dab of glue at the bottom of the canes then glue the top where they meet. Allow to dry, add hanging ribbon and glue final touches. Use as: ornaments, gift tags, napkin rings in center of each plate or personalized take home gifts for your guests. 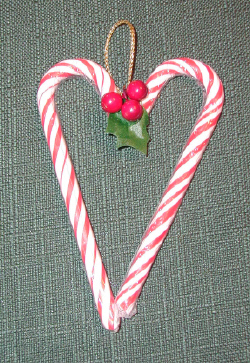 Tip: No one will eat these they are too pretty....so buy the candy canes after the holidays at 75 to 90% off. Copyright © 2007 by Lisa Sett of California. All rights reserved.